Rev. Fr. 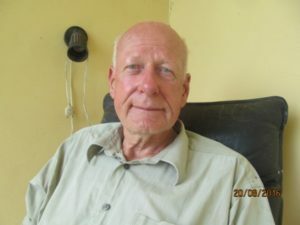 Sifrinus Germardus Ten Horn, 69, a Dutch andthe first person who braved and toured the lifeless villages around Lake Nyos after it exploded on August 21, 1986, recalls the disaster in this exclusive interview with The Post. He was just 39 and the Parish Priest of Wum Town, St. Martins Parish. Thirty years after, Rev. Fr. Ten Horn says Lake Nyos is still deadlyafter it killed over 1500 people and thousands of livestock. He fears that the equipment put in place to degas the lake may not be maintained properly and therefore would lead to another gas disaster. The Post:You lived the Lake Nyos disaster 30 years ago, how did it happen? Rev. Fr. Ten Horn: Of course, I did live the disaster but I was not present at Lake Nyos. However, the disaster happened on Thursday evening and it was only on Saturday morning that I got to know about it. I then went together with the SDO for Menchum at the time, Fai Yengo Francis, and some other people to Lake Nyos. We proceeded from Wum where I was living at the time and went as far as Komfutu and then the convoy came to a standstill. It appeared that they were hesitant to proceed but I noticed that some people came on foot from the valley up towards Komfutu, so I tried to calculate that if people are able to come from the valley there alive, then surely it should be possible to go in there too. So I asked the SDO for permission to proceed, and I went on to Cha and then I met people sitting in their houses. So you proceeded to Cha alone? Yes. The assistant commissioner of police went along with me and later other people followed. But I first went down by myself. Then we saw a lot of dead people and animals and we couldn’t be told exactly what had happened and why these people were dead. Some stories were told that the people had fainted and then when they woke up, they noticed that other people had died. We proceeded from there to Nyos. There, the situation was worse because we didn’t see any inhabitant ofNyos alive. There were some Fulani people who had come down from the fields and were sitting there just waiting, not knowing what to do. So in all the houses that we entered, we saw dead people and animals. Not even a fly was alive. It happened that thehelicopter of the mission flew over, circled over the lake and then came down. So I met the pilot and I told him that I had left the SDO at Komfutu with other heads of department, and asked if he could kindly bring me back to the SDO. So he accepted and circled over the lake again and somehow the waters were all dirty, reddish and we went to the place where I left the convoy but couldn’t see anybody so we went as far back as Weh but we couldn’t see anybody on the road. Then the pilot said he could not go further because of fuel problems. So he brought me back to Nyos and then took off from there. I proceeded from Nyos to Sobum where again I met the same situation,many dead bodies,some sitting in their houses and a lot of dead animals. By then, a large part of the day had passed. I then took those people who were injured that I could carry and brought them to the hospital so that they could be attended to. The SDO mobilisedthe people in Wum with their lorries and he got the prisoners spades and pix axes to go down and start the process of burying the dead people. I then went to Bamenda to give my report to my Embassy and to the Bishop’s House at the Cathedral. Then back to Wum. We tried to see what we could do to accommodate all the survivors who had been brought to Wum. So, we made a hall available at the Catholic Mission; the former Domestic Science building which was vacant and we found other places like the council hall and some other places where we put up the people. And then the government came in. Even the President of the Republic came and flew over the lake but did not come down anywhere near Wum. So it was obvious to them that a serious accident had happened there and they sent in the army to rescue more people and get them out and to start the process of taking care of all the dead animals so that they wouldn’t contaminate the water and so on. We hear there was a local committee that was put in place. How well did it function, and were you part of it? You are right; a local committee was set up to see how we could deal with the problem. The SDO invited me to be part of this committee. From there,with the government, we tried to find ways and means to feed the people the first few days and to get them beds and mattresses but of course, that was not a long term solution. Eventually, we got tentssent in by America and the Red Cross and other international organisations andother agencies. At the mission in Wum, we erected the tents on the football field so that every family could have its own tent. We also put tents at the mission compound in Komfutu. There were various places.Meanwhile,Father Nilan of Bafmeng had an empty convent there so he made that available for people to stay. Also Kabling had a tent campus put up. So then, the question was what had happened exactly and that was not very obvious and all kinds of scientists came in and did their studyand at a certain moment I think in October, they had a conference in Yaounde but they could not agree on the cause of the accident and of the dangers in future. There were two different theories on what had happened, but what they agreed upon was that it was a natural phenomenon and not what the newspapers said at that time that it was a planted bomb. It was nothing of that kind but a natural accident that had happened and the question was if this was a onetime thing or if there was a great chance that this will happen again in the near future. So as they could not agree on that, the government decided that the whole area would be out of bounds to everybody. So we said if the people cannot go back, then we have to find other locations where they can start their new lives. I then obtained a soil fertility map from EkonaResearch Station and at the heart of that we looked for suitable places. I broughtProfessor Oliver in Yaounde to indicate exactly where the gas had reached. With this information, we decided that Buabua, Kimbi, Yemge, Wum, Isu, Komfutu would be suitable places for the people to resettle. We had made a census to know exactly who at that time had been living in these villages and who did not have a place to go to. We then gave them the opportunity to choose between the various locationswhich we had found suitable for resettlement. The next thing was that we had to build houses there and I took care of houses in Buabua and Kimbi and Mr.Fru from Wada built some houses. The community alsobuilt some houses. In the meantime, two or more years had passed and when these houses were ready which were all built from international help. Some international sponsors sent their assistance directly through the government while others sent it through the church.Caritas International sent straight to the Archbishop and I also got funds from there to do my work. I went out to these villages and to the families and located the houses according to family size. Is it safe now for the survivors to go back? Well, I am not a scientist. I have a problem with maintenance but it is now a process of degassing the lake. Pipes have been placed so that any accumulation of gas can escape so we don’t get big accumulation like the one that caused the explosion at that time. My problem in Cameroon is maintenance of everything. If you look at houses they have not been maintained, roads, schools have not been maintained as well. My fear is that the equipment which has been put there is not going to be maintained and, in the long run, it won’t function anymore and there could be a similar accumulation of gases and a similar event again. So I don’t think it is very wise to go back but that is up to every person. I know that many people are anxious to go back to their original villages because they are attached to them. I don’t know if they will be able to manage to go back because from my understanding, the government says they will have to build their own houses and so on.Sometime ago, I saw a budget of FCFA100 million which was really insufficient to make available the facilities which are necessary in any village nowadays. What was your interest in the Nyos disaster when the Administration was afraid to descend to the affected villages? Looking back, I suspect that the SDO had some better idea of what had happened there. Remember at the time, we did not have all the facilities we have today like cell phones, Internet, no television, and very few newspapers. So, I was not even aware of what had happened, but the SDO knew that very well so I think they might have had a better knowledge than I had. They had their families and children which I don’t as a priest. I did not have that, so I could be freer to take such risk. Degassing LakeNyos has taken too long which has made the people feel frustrated. What is your take on this? They should not feel frustrated. That is why I said, in my opinion, I will not advise them to go back and settle neither in Cha, Nyos or Subom.The second problem of the lake is the dam which keeps the water inside because it is a very deep lake; about 200 metres deep. And it is an enormous quantity of water there. Professor Oliver who was at that time teaching is dead now. He discovered that water was sipping through that dam and they looked at the project and got people from outside to see whether they could do something aboutthat problem and these people were there and they tried to put concrete in the dam. They were there at the time that Boko Haram kidnapped some people in the Extreme North and when they got the news they became scared and left because there at Lake Nyos they were also close to Nigeria. So faras Iknow, the work has never been completed. I went back some years ago and still saw water sipping through the dam. I am not an engineer to know that this or that has to happen. I only observed that there was still water sipping through the dam. If the dam breaks, there will be another disaster. That has been well documented. All these factors make me suggest that the area should be added to the Kimbi Reserve and let the people be where they are now. That is what I will advise. About two years ago, I went back with a television crew from Holland and I saw that the resettlement has grown to be like any other village in the Northwest.I think some basic things like roads can be improved to have access to these villages so that what they grow can be transported to the other villages. I know they have now decided that if the people want to go back to Chah; that is the responsibility of the government.